How White Supremacist Ideology & Conspiracies Have Fueled U.S. Domestic Terror & Hateful Violence | Democracy Now! senior reporter for The Guardian covering gun policy, criminal justice and the far right in the United States. Web ExclusiveOct 04, 2017In 1898, White Supremacists Killed 60+ African Americans in One of Deadliest Mass Shootings in U.S.
LOIS BECKETT: In the discussion that we’ve had over these three incidents, and especially these two shootings—one in which the gunman looks like he initially tried to target a church and another an attack on a synagogue—we’ve often been talking about this in terms of hate or political rhetoric. And what’s really important to advance the discussion is to look at the evidence that the shooter in Pittsburgh was not just anti-Semitic, that he had been radicalized by a white supremacist ideology. We saw in the criminal complaint against the Pittsburgh shooter that he told a SWAT officer, while in custody, that he had wanted to kill Jews because Jews were trying to commit a genocide on his people. This is the central conspiracy of contemporary white supremacist movements in the United States, the idea that there is a massive plot to make white people extinct and that everything from immigration to accepting refugees to feminism to multiculturalism, that they’re all part of this plot. JUAN GONZÁLEZ: And, Lois Beckett, both—in many of these cases, the folks are fed or nurtured through social media. In fact, many of their thoughts were—reporters initially got through checking their social media accounts. The New York Times has a fascinating story today saying that just since the shooting in Pittsburgh on Saturday, on Instagram there were over 11,900 posts with the hashtag #JewsDid911, so that there’s an enormous—social media is still becoming the main organizing form for many of these extremists. I’m wondering if you could comment on that. And so, we can’t look at this as sort of just a broad problem of how do we fix social media, how do we fix Instagram, how do we fix Twitter. I think it’s important to really narrow the question and say Twitter, Instagram, Facebook are being exploited by hostile actors and by terrorists to recruit people who will commit violence. How do we focus on that particular problem? How do we—how do these companies take particular responsibility for white supremacist terror and how those terrorists are using their platforms? AMY GOODMAN: The Robert Bowers account on Gab reposted another user, who wrote, “Open you Eyes! It’s the filthy evil jews Bringing the Filthy evil Muslims into the Country! !” If you can talk about his link, Bowers’ link, a white supremacist’s link, between Jews and Jewish groups—we’re about to speak to a representative of HIAS. He particularly focused on this issue that a refugee resettlement organization was bringing what he called the “invaders.” And Brian Stelter of CNN just looked at Fox News and other right-wing outlets, and saying the level of times that they are talking about invaders, just in the last few weeks, has so escalated. And Bowers himself said, “I like” the way they’re changing the language of aliens, illegal aliens, to “invaders.” And it’s this link of immigration, as President Trump now, even as he goes to Pittsburgh, tries to divert attention to the border, saying he’s sending the 5,200 soldiers to the border—soon, on the border, there will be more soldiers than in Iraq and Afghanistan—sending more than 5,200 soldiers to the border and also saying he plans to, through executive order, end birthright citizenship. LOIS BECKETT: Amy, you’re pulling all of these incredibly troubling threads together, and it’s really important to recognize that the attack on the Tree of Life synagogue in Pittsburgh was an attack on Jewish people—and the obituaries of the people who died are just heart-wrenching—but an attack on Jewish people for supporting refugees, an attack specifically targeted at an organization that was helping have Shabbat ceremonies in honor of supporting refugees, and drawing on the Jewish history of persecution to emphasize how important it is that people who are fleeing violence and terror elsewhere in the world, that we have the capacity to welcome them and give them a safe place, and that that is a moral duty. JUAN GONZÁLEZ: Well, the Anti-Defamation League has found that anti-Semitic incidents in the U.S. rose by 57 percent in 2017, the largest single-year increase since it started recording such statistics. I’m wondering if you—your sense—and this is, of course, not an isolated situation here in the United States. There’s been a rise in anti-Semitic incidents across Europe, as well. I’m wondering if you could talk about the context in which this is occurring, as more and more right-wing governments are coming to power across the industrial world and even in many parts of Asia and Latin America, as well. LOIS BECKETT: Yeah. So, obviously, the context of rising anti-Semitism is very disturbing. And what was particularly striking about Robert Bowers, the Pittsburgh shooter, is that in looking at his online profile on Gab and the posts that he made, it was clear that he was channeling a lot of very ancient anti-Semitism, that a lot of the tropes and the hatred that he was sharing are very—are centuries old, that this is not a new phenomenon, and the anti-Semitic violence is a very old and a very dangerous ideology. But Robert Bowers was also someone who was actively in communication with other white supremacists, someone who was very familiar with the events of Charlottesville, where white supremacist groups marched through a university town with torches, chanting “Jews will not replace us.” And some of the statements that he made on his account suggest that he was familiar with those debates about what people who are white supremacists in America should do, the optics of different kinds of action, what’s going to be most effective for advancing his white supremacist beliefs—again, this belief in an all-white country, that the United States is only a country for white people, that other people should be shut out or don’t belong here or shouldn’t be allowed to have citizenship. And so, you saw him on this platform interacting, including interacting with other white supremacist activists. PRESIDENT DONALD TRUMP: If they had protection inside, the results would have been far better. This is a dispute that will always exist, I suspect, but if they had some kind of a protection inside the temple, maybe it could have been a very much different situation. But they didn’t, and he was able the—to do things that, unfortunately, he shouldn’t have been able to do. I hear the police were outstanding. I heard the police did an incredible job. And as you know, numerous police were badly injured. AMY GOODMAN: So, that was President Trump calling for armed guards in the synagogues. Lois Beckett, if you could talk about this and also—I mean, as we’re talking about this violence, you have Greg Bush in the Louisville area, in Jeffersontown. He has numerous weapons. Not clear whether he has them legally. He had to hand them over because of his violent background. Again, so often, we see the links to domestic violence in their past. But why these men are able to have these guns? Of course, Bowers used an AR-15. These linkages to violence—and this might—you might think of as a stretch, but because you are a Guardian reporter, I’m thinking about your colleague Ben Jacobs, who was body-slammed by the Montana congressmember who had to plead guilty to criminal assault. And why I’m bringing that up now is President Trump, just last week, held a rally in Montana, where he applauded Gianforte for body-slamming your colleague at The Guardian, this in the midst of the investigation into the murder of Jamal Khashoggi, with President Trump taking the side of the Saudi leadership—not to mention the CNN mail bombs, and President Trump has not stopped attacking the media all week. LOIS BECKETT: So, one thing I want to say that’s tremendously important, in these times where the amount of violence and the partisan intensity seems so overwhelming, is that being a gun owner in America is not a radical thing. In this country—this may not be—not everyone may agree with this, but in this country it is a normal thing to be a gun owner. Millions, tens of millions, of Americans own guns. Roughly a third of households are gun-owning households. So I think it’s really important not to indiscriminately lump together a lot of different issues, but to say that there is a big difference between being a gun owner in America—and even being someone who is skeptical of new regulations, wanting to really understand how much that they will help—and being someone who is advocating, for instance, violence against a journalist, or thinking that it is funny or cute that a politician might physically attack a journalist who is trying to ask him a question about healthcare, that it might be appropriate to praise or to joke about that, a politician who then went on to make false statements to the police, whose spokesperson made false statements to the police about that attack and about who was responsible for it. 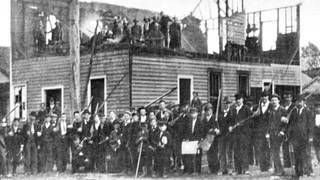 In 1898, White Supremacists Killed 60+ African Americans in One of Deadliest Mass Shootings in U.S.